Since our MSL Sol 1,000 mission update, Curiosity has been busy, continuing to climb the slopes of Mount Sharp as part of its methodical analysis of the historical record preserved within the different layers of the five-Kilometer tall mountain deposited in the center of Gale Crater. Back in June, Curiosity was placed in a safe configuration for a three-week stand-down due to Solar Conjunction, stowing its robotic arm and placing all moving parts in their home position. No commands were uplinked to the rover from Sol 1004 through 1027 when reliable communications with MSL were not possible because the sun moved between Earth and Mars. Throughout the conjunction, MSL continued regular observations with its REMS weather monitoring station and RAD Radiation Assessment Detector. Staying in one place for an extended period provided the welcome opportunity of studying changes in terrain over a longer time span as the result of wind transport or Marsquakes. 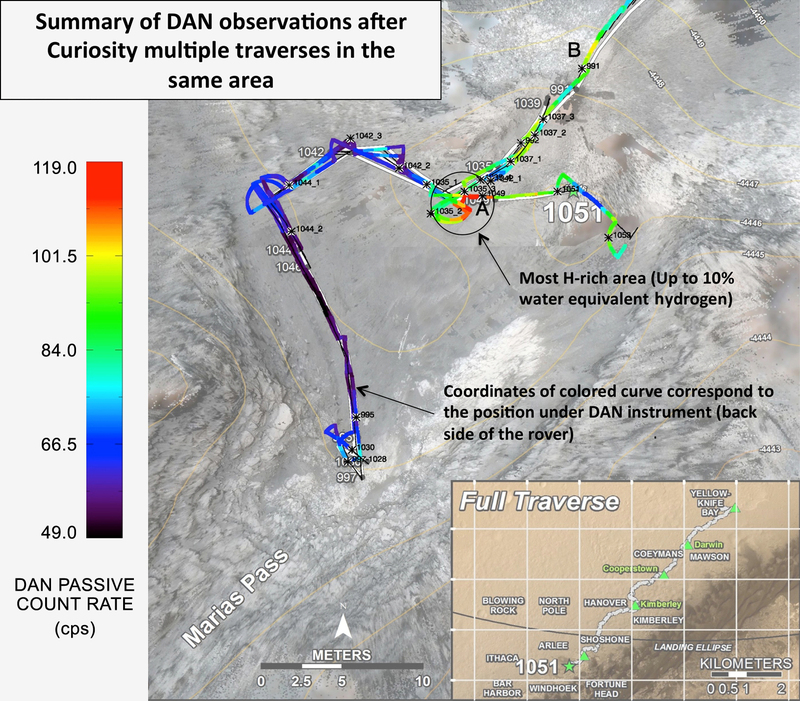 Generally, the first days after coming out of conjunction were focused on studies of the contact between the Pahrump and Stimson units representing the intersection of two different geological systems that was visible in imagery from orbit and scientists were eager to get the ground truth in the form of measurements delivered by Curiosity. The two types of bedrock meeting in this contact area are a pale mudstone examined earlier by Curiosity at the Pahrump Hills location and a darker, finely bedded sandstone overlaying the lighter unit. Contact units such as this are of great interest as they hold information on changes in environments and their appearance can provide clues as to whether these changes occurred abruptly or over a period of time. Interestingly, MSL found a thin layer of coarse-grained rock that separates the two bedrock units – unique in appearance, comprised of a mix of round and angular grains indicating that some came from close by while others traveled some distance before forming the rock. Also, colors among the different grains are more varied than in any other sample previously studied by MSL. 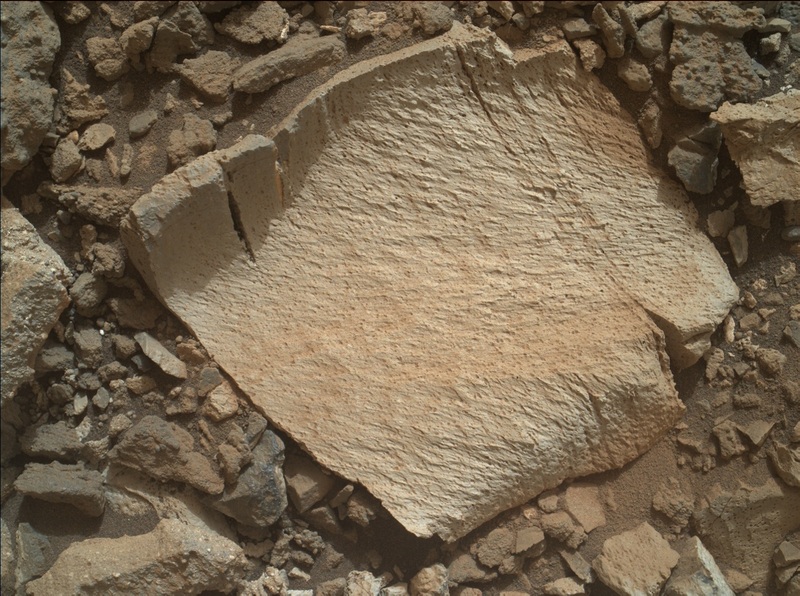 To piece together what happened in this transition period in which this thin sandstone layer was formed, scientists put Curiosity to work for a period of weeks, looking at different areas along the contact line. Curiosity backtracked on Sol 1034 to go back to its Sol 991 location for further studies after quick analysis of data showed that more information on a bright rock outcrop was needed. This also allowed teams to have a look at the data from the contact unit to find targets of interest for a possible second pass. 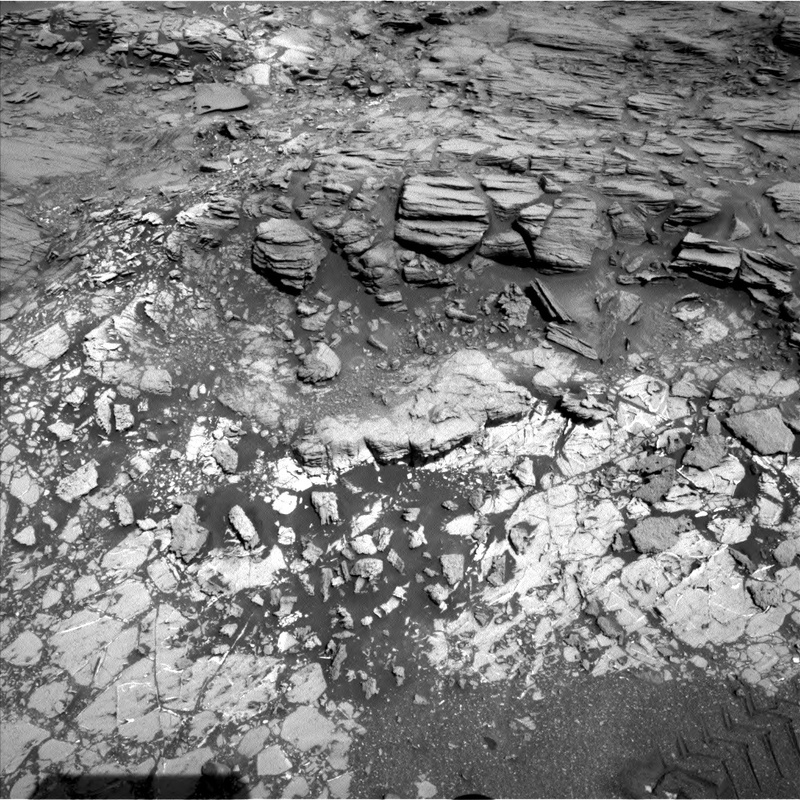 Curiosity spent several sols approaching a rock outcrop called Lion, comprised of the bright material that was of particular interest for this second pass of this location. The first pass revealed that the rocks in the area were rich in silica, as measured by the ChemCam instrument, and contained an abundance in hydrogen, detected by the Dynamic Albedo of Neutrons instrument. This was of particular interest because high-silicon content in rocks provides favorable conditions for preserving organic material. 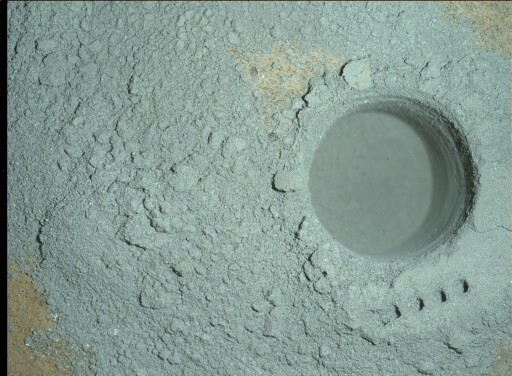 The primary drill target, ‘Buckskin,’ was brushed off on Sol 1057 followed by a long integration of the Alpha Particle X-Ray Spectrometer and the usual mini-drill test on Sol 1058 to determine whether the rock was safe for drilling and would not liquefy during the drilling operation. 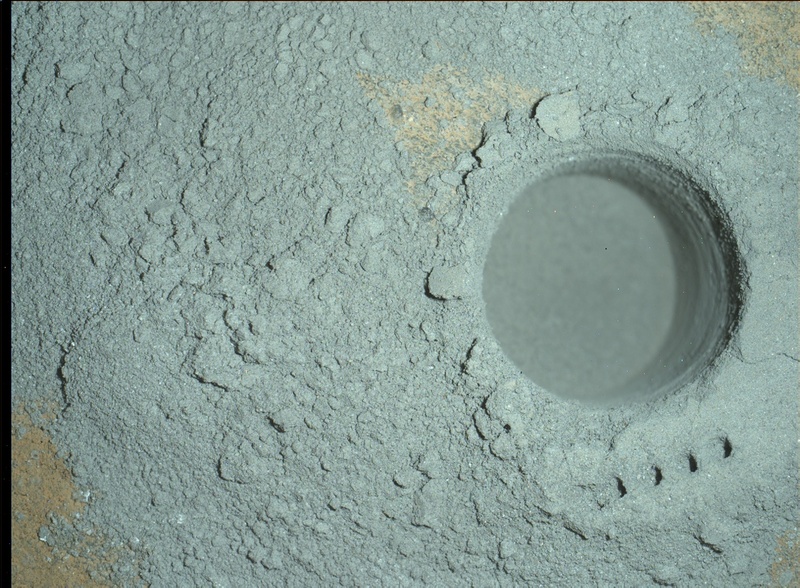 The full-drill operation was successfully completed on Sol 1060 and sample material was distributed to the CheMin instrument for mineralogy analysis along with visual observations of the material in the scoop. The successful drilling operation also showed that there was no repetition of a transient electrical short within the hammering system of the drill. While busy re-visiting the Lion site, Curiosity also took a second job of serving as the primary surveying asset of the backside of the sun to track sunspots before they rotate towards the Earth and potentially send out solar emissions. STEREO-A, one of two sun-monitoring spacecraft, was right behind the sun as seen from Earth, disrupting communications with the ground for a period of weeks – leaving only Curiosity as the only craft currently behind the sun and capable of resolving sunspot locations. While STEREO-A was out of commission, Curiosity regularly looked up and used its Mast Cameras to deliver data to NASA’s Space Weather Service for the assessment of the evolution of sunspots that could cause space-weather events when rotating towards Earth. 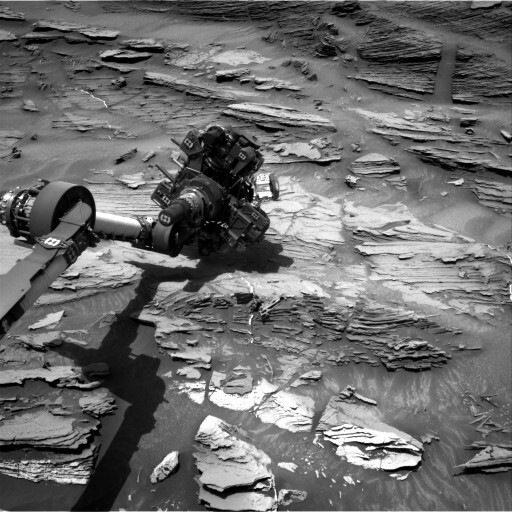 Having collected a drill sample from the hydrogen-rich rock, Curiosity spent several more sols using its remote sensing and contact science instruments at the Lion location to collect more data needed for the characterization of this unique terrain encountered here for the first time in this mission. As has become tradition for MSL drill sites, Curiosity used its MAHLI imager to acquire a series of mosaic images to be assembled into a Mars Rover Selfie, this time using a different perspective, looking up to the rover from below. Leaving Lion behind on Sol 1064, Curiosity drove back to the Marias Pass and Missoula targets to make a second pass on the contact layer that had been observed earlier. ChemCam was particularly busy when the rover was back at Missoula, conducting laser-induced breakdown spectroscopy on a range of vein targets to help scientists determine their relative timing of formation. Curiosity departed on Sol 1072 to begin a series of traverse sols – primarily focused on driving progress and only short stops of a few sols at most if interesting targets are found along the way. 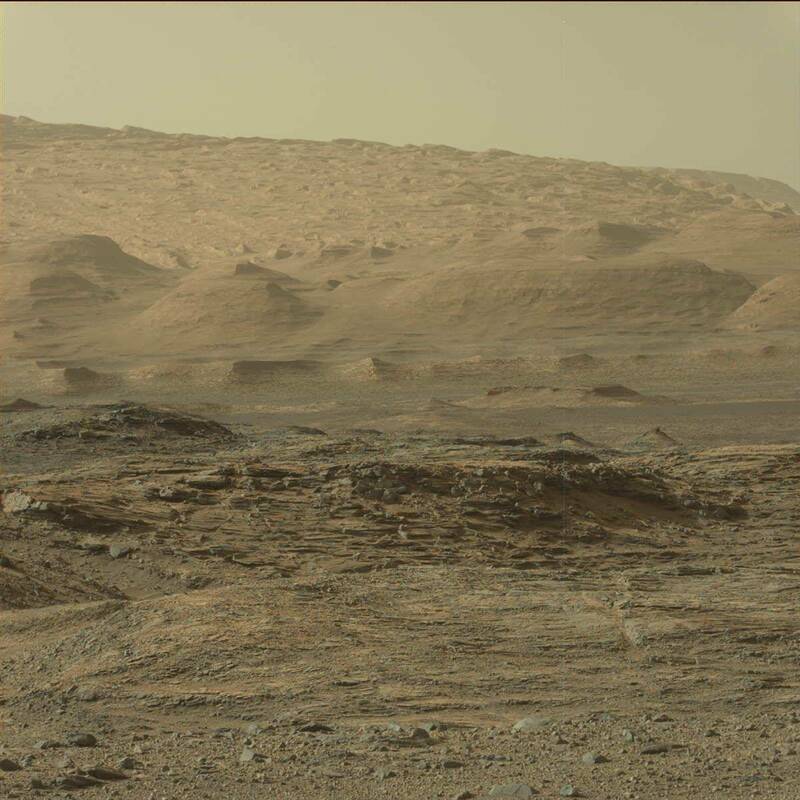 Making good driving progress, Curiosity brought its total driving distance to over 11 Kilometers. 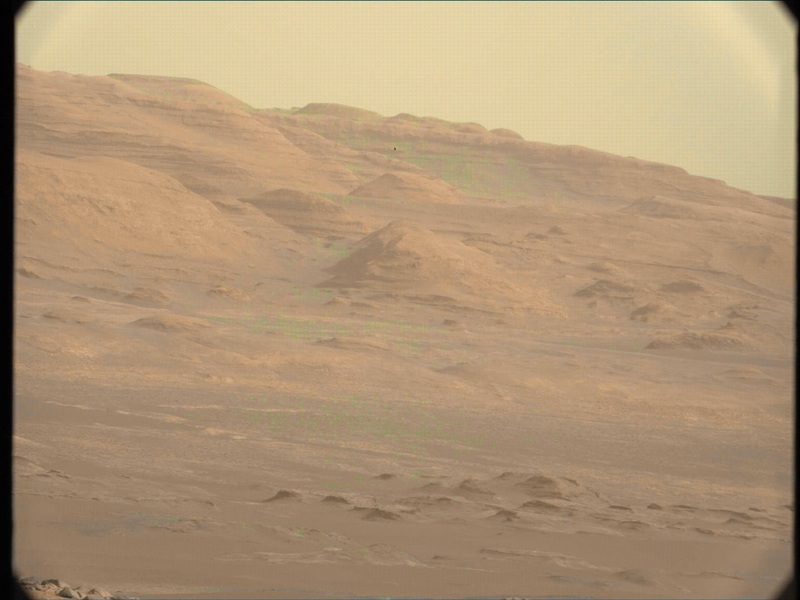 As per the usual procedure, Curiosity collected targeted science data in the morning based on post-drive imaging from the sol before. After driving, photos are collected for the science and drive planning of the subsequent sol. 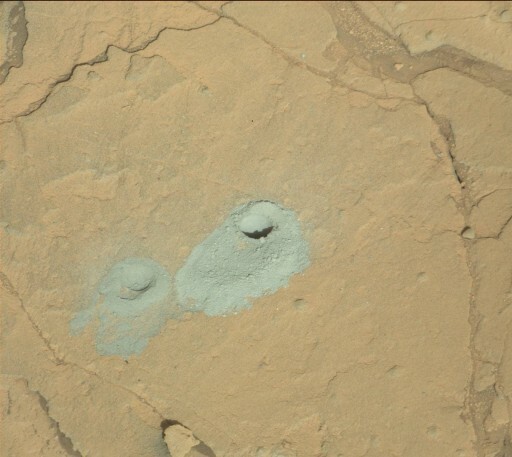 The Sample Analysis at Mars (SAM) instrument was in action on sols 1075 and 1076 to analyze some of the drill sample acquired at Buckskin. MSL continued its southward progress, making a stop at an area called Williams where plenty of targets were found to be good representatives of the Stimson unit, the next geological system being studied by Curiosity. Taking a few sols between 1085 and 1092, Curiosity conducted contact science with MAHLI and APXS, also using ChemCam, DAN and the Cameras to study the terrain in the area in addition to distributing another sample portion to SAM and dumping the rest of the sample for APXS analysis. 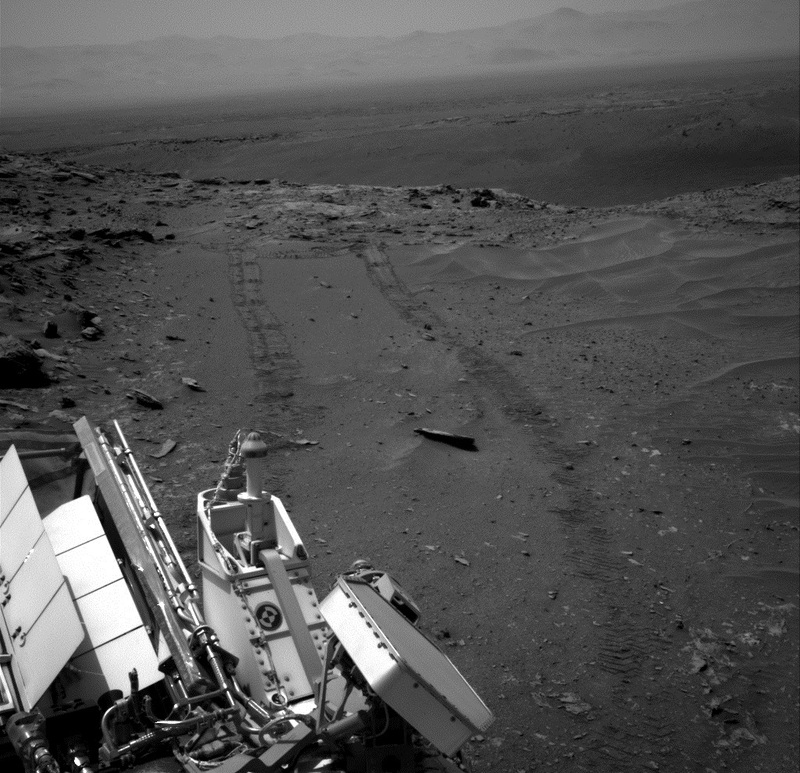 Departing Williams, Curiosity headed west before turning back to the south to reach Bridger Basin and Bagnold Dunes, the next targets identified by the science team. 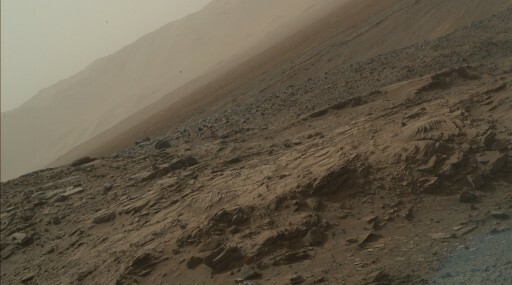 MSL headed through the basin, on the way collecting panoramic views, before arriving at the south-western edge from where photos of the Murray Formation Outcrop could be taken to plan for Curiosity’s drives and studies in this area. A small issue with the robotic arm slowed down the expected driving progress on Sol 1101, but the science team made the best of the opportunity and inserted additional observations of the Badlands rock target. A coordinated atmospheric observation was on tap on Sol 1105 when Curiosity imaged the sun and sky while the Mars Odyssey orbiter passed overhead, studying the atmosphere from above. Heading over the threshold between the Stimson unit and the Murray Formation, Curiosity used its instruments to look for any signs of compositional changes in the rocks seen in this area compared to MSL’s earlier encounter with the Murray Formation. 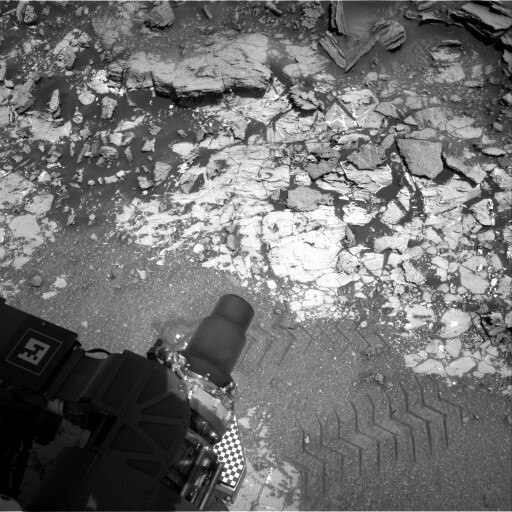 A bright outcrop was the focus of a contact science block on Sols 1108/09 and Curiosity looked back to photograph the contact between Murray and Stimson before entering some rough terrain. Scientists believe the Stimson unit to be a wind-deposited sand dune turned into sandstone, as evident by crossbedding present over a large area. On Sol 1112, Curiosity arrived at Big Sky to begin a multi-sol campaign – first conducting contact science and testing the rock for stability before performing the mini-drill test on Sol 1118 – all while continuing the daily observations involving ChemCam typically used on multiple targets, REMS, DAN and RAD that are active most sols as are the MastCameras delivering dozens of shots of targets and surrounding geology. The full-drill at Big Sky was a success on Sol 1119, delivering sample material from an ‘ordinary rock’ instead of rocks altered in the presence of fluids which were expected to be the next targets for a comparison in composition. 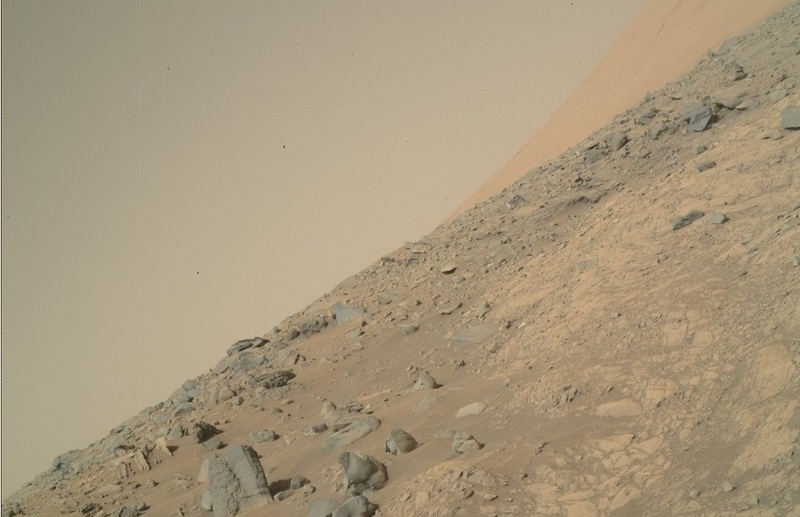 Over the course of a week, Curiosity’s CheMin and SAM instruments ingested and analyzed sample material in addition to the usual examination of the discarded tailings using MAHLI and APXS. While the laboratory instruments were busy, the rover continued contact science and remote sensing before heading off on Sol 1127, making a short 7-meter drive towards the next drill target. 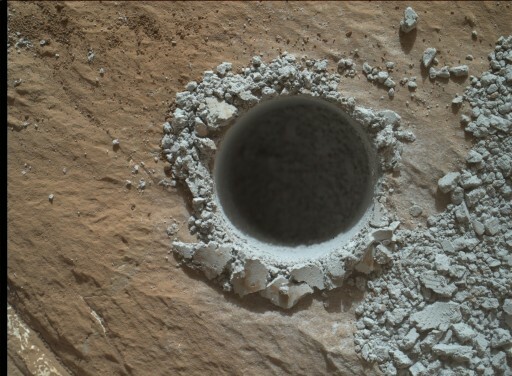 Drilling was preceded by the usual contact science and remote sensing operations to survey the potential drill targets and allow the science team to chose the one deemed safe and stable enough to be drilled into by Curiosity’s percussive drill. The team settled for the ‘Pilgrim’ target, beginning with the mini-drill on Sol 1134 to be followed by the full drill operation when it can be confirmed that the rock meets all criteria. 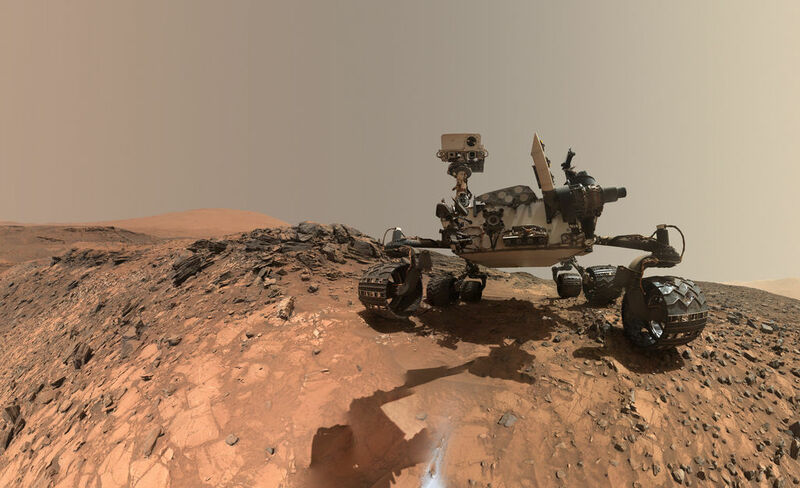 In recent weeks, NASA announced two findings regarding water on Mars. The Mars Reconnaissance Orbiter MRO delivered data over a period of years and from a multitude of locations suggesting that liquid water exists transiently on present day Mars. 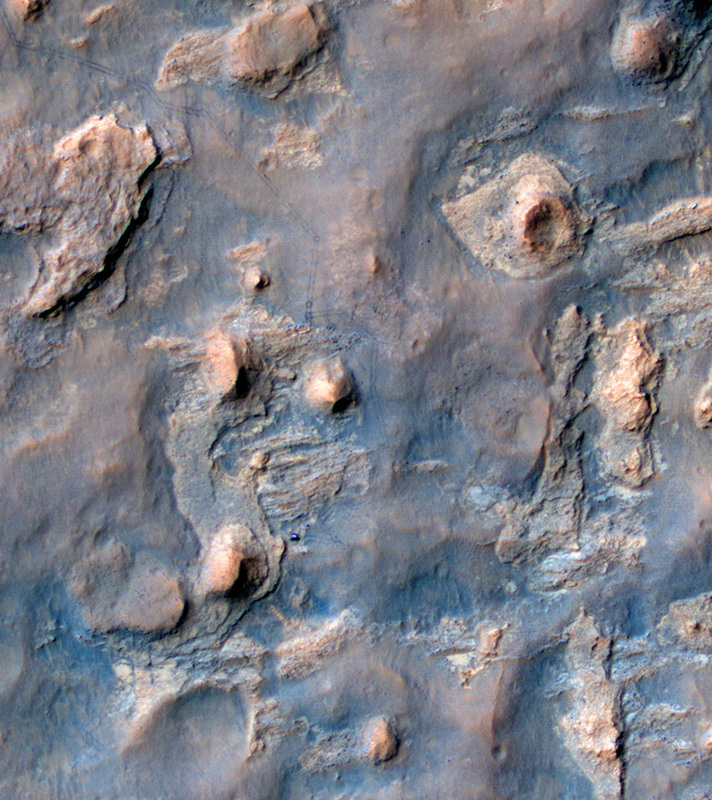 Images acquired by MRO’s sharply-eyed HiRISE instrument show downhill flows referred as recurring slope lineae that often appear as darker streaks on steep hills. Additional data delivered by the Compact Reconnaissance Imaging Spectrometer for Mars showed the presence of hydrated salts within the downhill flows. 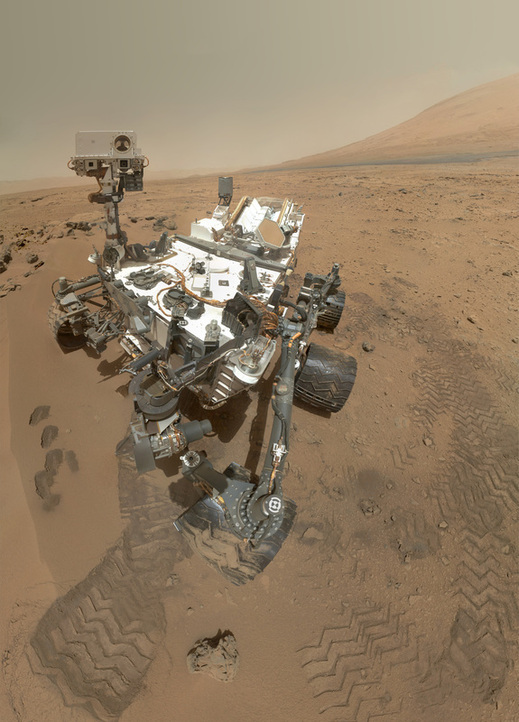 Data from Curiosity was used to expand on the earlier finding of flowing and stagnant water that was once present within Gale Crater. 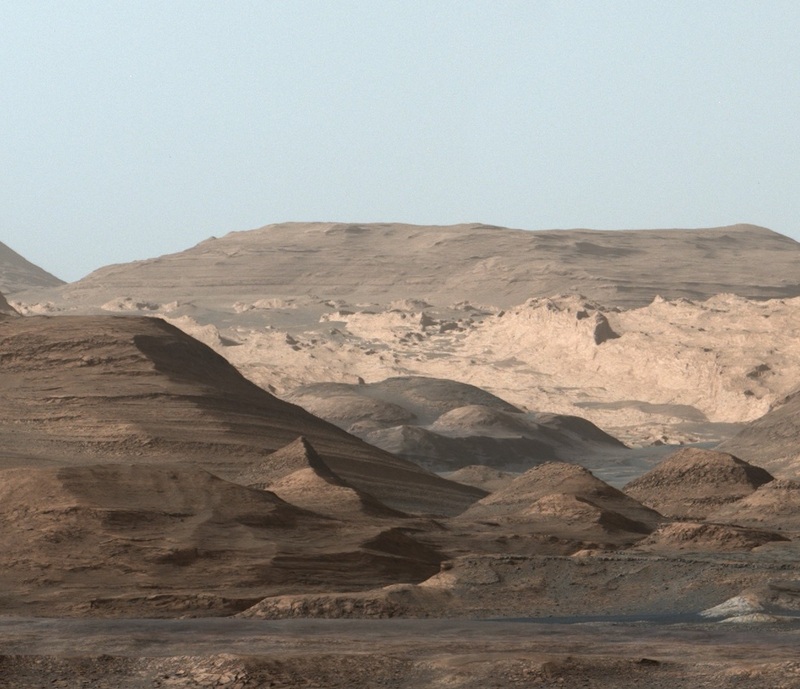 The latest results from Curiosity show that the bottom layers of Mount Sharp were deposited over a period of around 500 million years about 3.8 to 3.3 billion years ago involving a combination of fast-flowing streams to transport coarse gravels observed by Curiosity as well as stagnant lakes in which fine-grained deposits were formed, as found by Curiosity closer to the mountain. The lakes likely expanded and contracted over a period of hundreds of millions of years, forming the lower portion of the mountain. As data from orbital observations and Curiosity imagery indicates, the sediment layer created in water is about 75 meters in thickness which in turn suggests that the water-transported sedimentary deposition easily extended 200 meters above the crater floor. Sedimentary deposits furthermore indicate that interaction with water could extend as high as 800 meters with lakes likely fed by rain or snow. All features above 800 meters were created through wind-deposits in dry conditions. 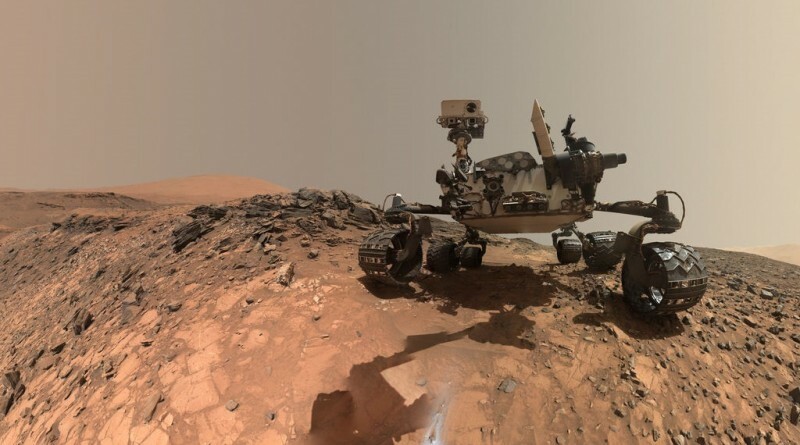 These findings again bring forward the question of what happened to this ancient Martian environment characterized by a thick atmosphere and a long wet episode of 500 million years. Currently active in orbit around Mars, NASA’s MAVEN spacecraft is attempting to answer how Mars lost most of its atmosphere and turned from a habitable planet to the deserted world Curiosity traverses today.